With Acai, Resveratrol, Vit. D3, Vit. K2 CoQ10 and Over 120 Whole Foods! Nutritional support for Free Radical Defense, Natural Energy Production and Overall Well-Being. The Source of Life Gold line of whole food-based multivitamin supplements is an indispensable favorite of those who strive for optimal health. Every Source of Life Gold supplement feature revolutionary, all-natural ingredients with more Antioxidant and Anti-Aging power than any other multivitamin available. Source of Life Gold Drink Mix delivers all of these healthful features in a delicious, easy-to-use-tropical-fruit-flavored drink mix that makes multivitamin supplementation a daily treat. 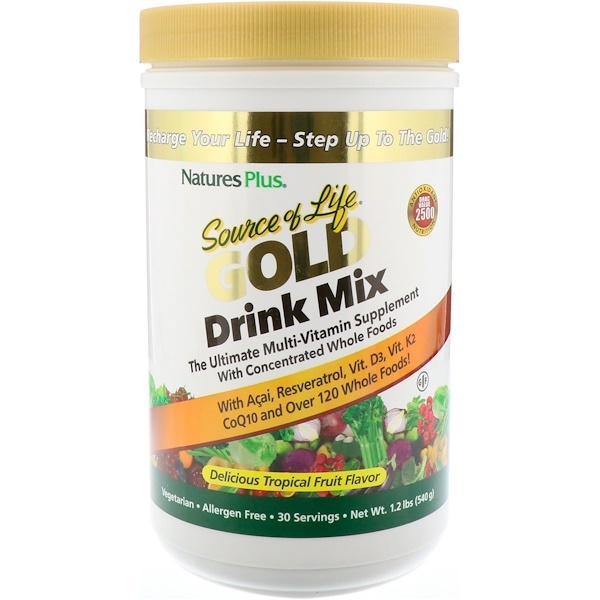 Source of Life Gold Drink Mix features a high-potency complete vitamin profile concentrated whole foods, synergistic cofactors, antioxidant phytonutrients, live probiotics and highly active enzymes. Organic Gold Standard B Vitamins - Innovative new methods of concentrating the water-soluble vitamins within organic holy basil, lemon, and guava yields a B-complex blend of unprecedented potency. Organic Mushroom Blend - Immune-boosting myconutrients from certified organic whole food mushrooms. More than 120 colorful fruits and vegetables - Energizing, health-enhancing phytonutrient benefits from more than 120 whole food concentrates and extracts of the world's greatest green, red, blue, yellow and white fruits and vegetables. 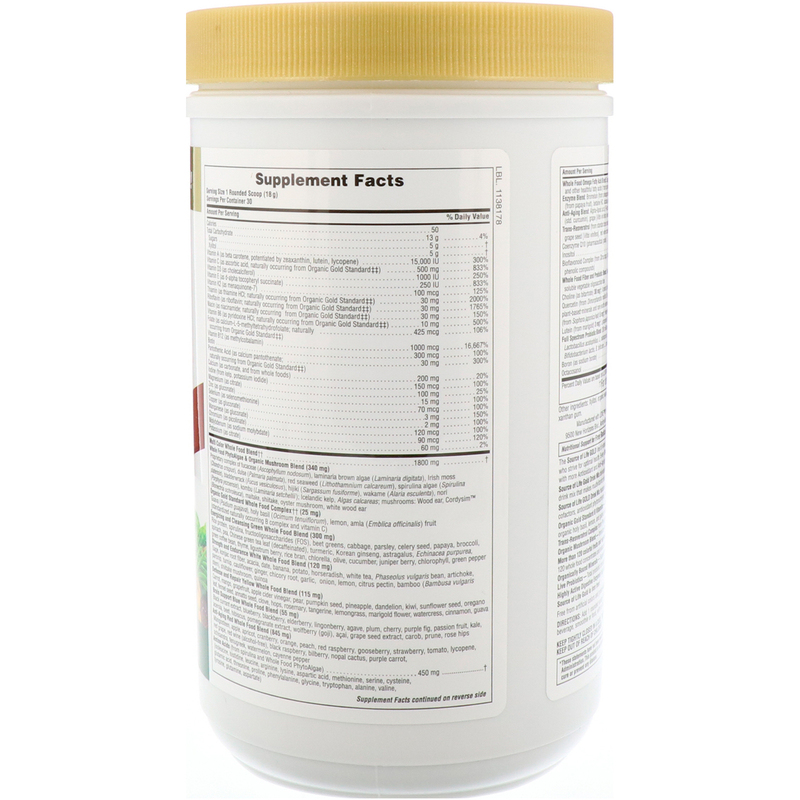 Organically Bound Minerals - Superior absorption, including citrates and amino acid-bound minerals. Live Probiotics - Total probiotic coverage of the entire digestive tract, including oral, intestinal and colonic probiotics. Highly Active Digestive Enzymes help the body to absorb and utilize the most from the foods we eat. Add 1 rounded scoop of Source of Life Gold Drink Mix powder to a serving of your favorite beverage, smoothie or food, with or just before a meal. Xylitol, organic evaporated cane juice, natural flavors, citric acid, calcium citrate and non-GMO xanthan gum.